Lovely Glass Hurricane in yellow color are a real priced possession for your home decor and to add more charm to its beauty it is also adorned with wood color metal which is also supporting the glass votive with strong base. These candle hurricanes are made of cracked glass, which gives more shine, and shimmer to the ambience. Sizes Available : 12", 14", 16"
With a firm commitment to quality, we are involved in offering a wide ambit of Antique Lalten Handicraft. 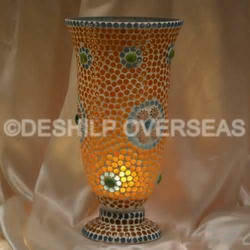 Our range of Hurricanes Lamps exudes the fine workmanship of our artisans. Made out of optimum material, these bear latest styles and designs. Our range of Hurricane has an elegant glass surface and a solid metal stand that tightly holds the body assuring its durability. Moreover, we also have the further customize these as per the specifications laid down by our clients. We bring forth an extensive range of Antique Item to our valuable clients. Our product range is largely used in various corporate offices, auditoriums, malls and other public places. Further, our product range is considered as excellent combination of their brilliant. Clients can avail these products at economical prices.